· The Youth Red Cross is the most important constituent of its parent organization “Indian Red Cross” which was formed in 1863 by Jean Henry Dunant. · It is a group movement organized at the initial stages for students between 18 and 25 years of age within the college(s). · The Youth Red Cross Society of the college was established in the year 2011 with the objective of evoking awareness towards social responsibilities among the youth. · Under the guidance of the Officer In-charge the students are trained and encouraged to manage the affairs of the group and organize activities to instill in them leadership qualities. · Health activities/ HIV and AIDS stigma and awareness. · Accident prevention and first aid training. · Maternity and child welfare. · Social welfare activities/environmental and extension activities. · Blood donation camps/workshops/awareness camps/rally etc. Since its inception a number of students have joined the unit. However enrolled students in the academic sessions 2011-2015 and 2016 are more than 250. Volunteers have been providing their valuable services as and when required. They pledge to serve in the promotion of health, the relief of suffering and in building a culture of peace without any form of discrimination and to hold in friendship the boys and girls of all institutions. They also promote community feeling among themselves and in the vicinity through a range of extension and outreach programmes. · Special camp organized for sickle-cell test in a village in collaboration with NSS unit. · Sickle-cell test awareness camp. · Rally on World AIDS Day - 1st December, 2011. · Volunteers participated in the Red Ribbon Express rally. 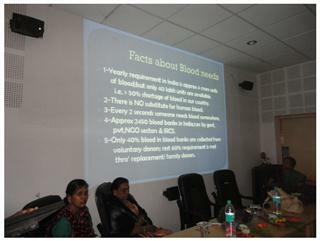 · Workshop on Blood Donation “Drive”- 4th December, 2012. · Blood Donation camp - 7th December, 2012. · One-Day Health and Nutrition Awareness Camp at Kodiya village on 15th December, 2012. · Guest lecture on Health, Nutrition and Hygiene at village Khapri – By Dr Archana Chauhan on 28th September, 2013. · Workshop on Donate Blood on 4th December 2013. · Blood Identification & Donation “ A Noble Cause” –a Camp organized on 6th December 2013 in joint collaboration with NSS & HDFC Bank, Durg. · Donors were felicitated with commendation certificates. · Plantation program organized on 5th June 2013. · Volunteers Awareness Campaign & Rally on World AIDS Day -1st Dec’2013. · Voluntary blood donors donate blood whenever urgency occurs. · Seminar on “Health and Democracy” –Invited Resource- Dr Praveen Sharma ,Director-BM Shah Hospital and Research Centre , Bhilai, on 17th November, 2014. · Demonstration and presentation by YRC volunteers on Disaster Preparedness First Aid. · One-Day Social Awareness camp at village Khamariya for NSS and Red Cross volunteers on 30th November, 2014. · Workshop on Donate Blood – 4th December, 2014. · Blood Donation Camp in association with Red Cross Society, Durg and HDFC Bank and NSS – 5th December, 2014. · Invited Guest, Dr Prashant Shrivastav, CMO Durg Hospital and Principal Dr Sushil Chandra Tiwari inaugurated the camp. · Guest Lecture on Traffic Rules & Road Hazards – Invited Guest Inspector Rajmani Singh on 17th Oct, 2015. · One Day First Aid Training Program for YRC and NSS students at college campus on 14th Dec, 2015. · 50 students visited the Old Age Home situated at Pulgaon, Durg on 11th Jan, 2016. · Volunteers participated in a Rally on Indian Youth Red Cross Day on 8th May 2016 with Junior Red Cross Society of Durg District. The volunteers also participated in various competitions held on this day such as debate, quiz and rangoli etc. · Induction programme for new volunteers in the month of September. · Visit to Sneh Sampada School, Sector- 8, to spend a day with the children who are mentally and physically challenged. Nukkad-Natak performed by the Red Cross and NSS volunteers. 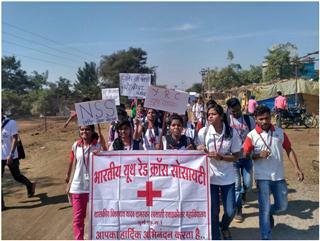 · A huge Rally was jointly organized on 1st December 2016 by Youth Red Cross and NSS Volunteers and NCC cadets of the college to spread social awareness regarding AIDS on World AIDS Day. · A host of volunteers are serving the needy, injured and those who are in urgent need of blood. They all stand united to lessen the pain and suffering of not only humans but also that of animals. Sushil Asati –an active volunteer of YRC and a student of BSc. First year was awarded NIPUN BADGE ROVER STATE (Rajyapal award) and a Medal on 11th Dec, 2014. He was also felicitated by the college fraternity and Youth Red Cross Society. Prince Piyush Tandon, Kailash Baghel, Yogesh Kumar, Bhupendra Sahu, Sanjeev Bais, Dinesh Devangan, Aman Ujjavalkar, Shekhar Devangan, Lokesh, Anand Sahu, Dushyant Sahu and other volunteers were felicitated with medals, certificates and T-Shirts for their commendable services in 2015. In Jan 2016 on the Annual Prize Distribution Day volunteers were felicitated with certificates for their social and community services within and outside the campus for the session 2015. · Save the Girl Child Campaign. · National Integration – Join hands together for humanity. · Orphanage visit / Old Age Home Visit /Differently-abled children.